The Cadillac appellation was born in 1973 within the Premières Côtes de Bordeaux appellation where certain vineyard plots were noted for their capacity to develop botrytis on the grapes. 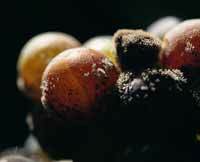 Botrytis is a microscopic fungus that can destroy a fruit crop but for making sweet white wines it is a godsend. The territory of the appellation extends over 22 villages on the right bank of the Garonne river to the south-east of Bordeaux, from Baurech to Saint Maixant. Occupying south-facing slopes that are rather abrupt the vines are well exposed to the beneficial midday sun. The soils are gravelly or made up of a clay and limestone mix ; the gravel and the slope of the terrain guarantee excellent drainage. Wine of the Cadillac appellation is a sweet white wine that is produced from grapes attacked by ‘noble rot’ i.e. the microscopic fungus botrytis cenerea. This fungus, which exists all over the world, can destroy a fruit crop but for Cadillac wines it is a godsend. In order to develop it requires specific climatic conditions. The winegrowers of the appellation have endowed themselves with a strict set of rules for making their wines in the purest tradition of the sweet Bordeaux whites : a late harvest with several pickings to harvest only the fully-botrytised grapes, much-reduced yields, vinification in small volumes, closely supervised ageing, and bottling systematically carried out at the property. These wine are best appreciated at between 8 and 10°C. The robe can vary from pale yellow to gold, or topaz, and with age can even take on an amber hue. 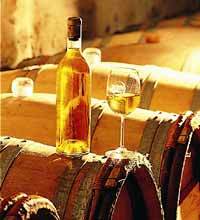 Each vintage has its own particular aromas : honey, acacia flower, honeysuckle, vanilla, citrus fruits, apricot, etc. On the palate the wine is fruity, racy, and lively when it is young, and acquires more mature body, becoming unctuous and smoother with age. These wines are perfect as an aperitif or apetizer, they go well with nuts, Roquefort cheeses, ginger-bread, or cheese, and are a marvellous accompaniment for Indian or Chinese dishes. To accompany exotically spiced food, melon, or foie gras with a Cadillac wine is to close to perfection. Cadillac wines can also be paired beautifully with white meat, poultry, fish, or Asian cuisine, and go particularly well with all cheeses, especially blue cheeses. They will also enhance the flavour of chocolate desserts, fruit tarts, sorbet ices, or a fresh fruit salad.